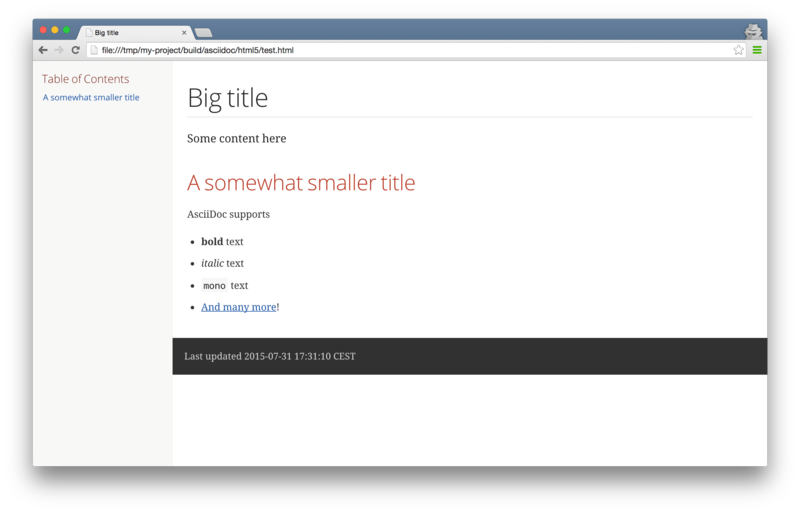 Some days ago, I created a Simple REST interface for my Open Source Epub organizer. I used the excellent DropWizard documentation, which guides you through the process. However, the DropWizard documentation uses Maven. While that’s not really a problem, I’m trying to switch to Gradle. For creating a executable jar in Gradle, there are some plugins available, like the FatJar, UberJar. It’s also explained in a sample DropWizard project. However, if you look at the forks, all the forks are different. Some of them use FatJar, some use UberJar, some switched from one to the other, etc. It’s a bit of a mess. Fortunately, there’s also support from Gradle itself, and while the documentation is a bit minimal in this area, it works very nicely. // remove the security files (from mail.jar / activation.jar) so that the jar will be executable. In short, no need for extra plugins, but using the Gradle core functionality most of your requirements to create executable jars should be covered. Each week, we work on the Discobot project, which goal it is to make Groovy run on Android. While that in itself isn’t the biggest problem, as you can read in our previous blog posts, making developing for Android using Groovy and making sure we are feature complete, well, let’s say it’s challenging. Current efforts are twofold: one is developing a set of developer tools using Gradle, on which Marcin is focusing the most. On the other hand, we need some tools to make sure our version of Groovy works on Android, which is what I (Erik) am focusing on. As you can see in the screenshot above, our project is already capable of building the project and installing it on the emulator using the Gradle plugin. Also, the start of a demo application has been built, which will allow us to run all the tests packed with Groovy. For that, we have tweaked the build process of Groovy itself, so that it produces a jar which includes all the tests. This jar is used in the Discobot project. To figure out which tests are available, an Android Classpath Scanner is used. It uses a hack by inspecting the Dex files itself, but we are currently using that to scan for files which extend from GroovyTestCase, and run those. Once that is working, we’ll probably write a better UI around it. 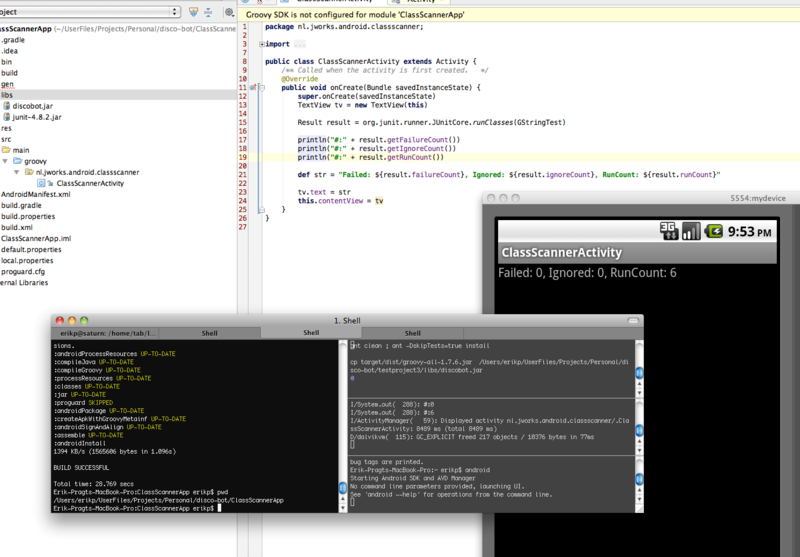 Also, the Gradle plugin still needs some finishing touches to improve the overall user experience. Marcin is currently working on the last gradle task which will initialize the android project structure. It will call the android create project command-line tool from Android SDK, change the src directory structure of your project to obey Gradle conventions and create a ‘Hello World’ activity written in Groovy, so you can quickly get a simple working application to start out with! We’ll try to update you again with more information next week!